I don’t think there is any denying what LG has done with the G5. They created an ultra-premium phone that takes them into previously unexplored areas (that all-metal body, baby), while also managing to tick a bunch of boxes for features that other manufacturers avoid or ignore, like removable batteries, always-on displays that aren’t crippled, and the latest in charging tech. 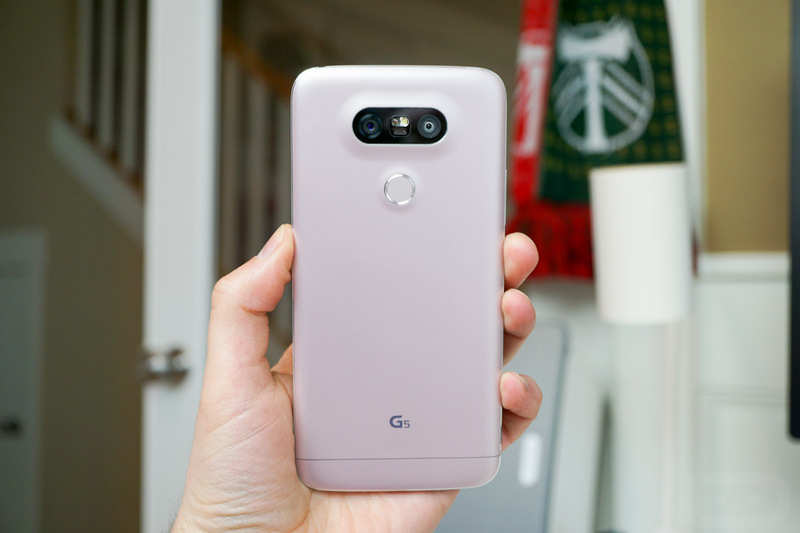 To highlight those, along with a couple of areas where LG is taking a risk that could pay off in the long run, we picked the seven features that help the G5 standout from the rest of the smartphone crowd at the moment, including the Galaxy S7 and S7 Edge. Come April 1, you’ll get to decide if these are enough. Google’s Project Ara was at one time supposed to be the future of modular phones, where you could swap parts in and out to add or adjust functionality. Project Ara has yet to become a reality after a couple of years of work, so LG and the G5 are stepping up to take the lead on the idea. With the G5, at least at launch, we have a camera grip and a DAC as modules. Each might be targeted at small audiences, but the fact that LG is ready to take on modular phones is something to get excited about. Even if you don’t care about the camera grip or DAC, you have to appreciate that LG is paving way for a future where you could swap in or out all sorts of add-ons. It could be docking your phone into a speaker for a real audio experience, adding on a credit card swiper for retailers, expanding battery capacity without the hassle of a case, a way to give your non-smart car a true in-car display experience, etc. The future of modularity in phones is here because of LG. The always-on display is a big deal in 2016. Both Samsung and LG included always-on features in their flagships, but so far, only LG seems to have gotten it right. With Samsung’s always-on, you can customize a clock, with battery status and date, or even toss in a calendar or background image, while seeing the occasional notification. Unfortunately, Samsung limited the functionality with notifications, only opening the phone up to showing notifications from its own stock apps, like the dialer or messaging app. On the G5, you not only get the time and date, but you get notifications showing from every single one of your apps. Taking that idea a step further, as each arrives, the always-on display highlights the app with a blown-up animation of the app’s icon, so that you know exactly which app you may or may not need to check. In this battle of always-on displays, it’s LG 1, Samsung 0. Last year, Android received support for USB Type-C, a port that will become the future of charging, file transfers, and expansion. We saw the Nexus phones all receive a USB Type-C port, along with the OnePlus 2, leading us to expect that all major manufacturers would jump on board with Type-C for 2016. LG held up their end of the bargain by including Type-C in the G5 and we’re expecting HTC to do so as well. Samsung, probably for VR-related reasons, skipped out this time around. 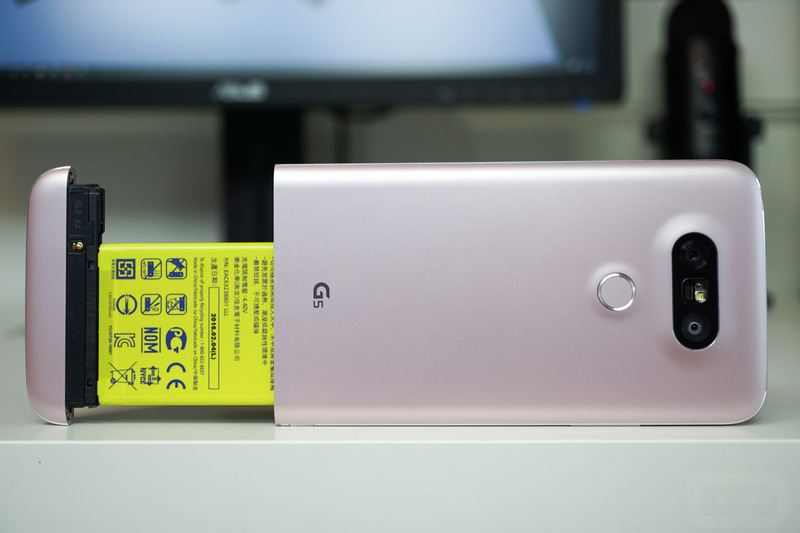 On the LG G5, LG doubled down by also including Quick Charge 3.0 support through the phone’s Snapdragon 820 processor. QC 3.0 allows for even faster charging times than any other phone, including Samsung’s, since they also skipped out on the new charging tech, even though their US S7 variants house the 820. With the G5, you get both quick and convenient charging, something not many phones can lay claim to. Maybe I’m just getting used to giant phones by now, but the LG G5 is a really nice size. LG says that they shrunk the phone’s display down to 5.3-inch (from 5.5) because their users told them this would be a sweet spot. While I would tend to agree that 5.5-inch is a bit large and would prefer a phone with a display size around 5-inch, I’ll take 5.3. Overall, though, the phone isn’t that much smaller than the G4 from last year. In fact, it is actually a bit taller, though not wider. Still, it feels great in hand, partly because of the new soft-touch metal finish, but also because of its curved body with plenty of roundness that lets it really nestle into your hand. The G5 isn’t large by any means, but it’s also big enough to give you that modern smartphone experience. 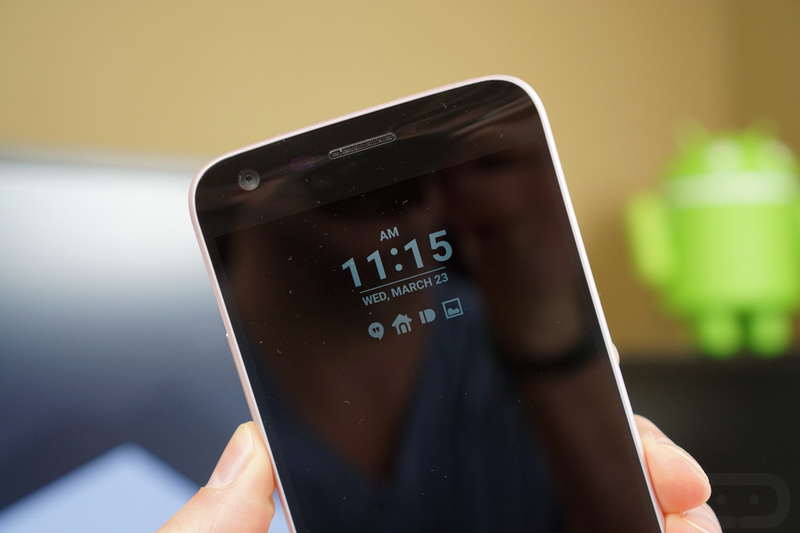 LG introduced fingerprint readers to its phones with the V10 at the end of last year. I’ve been clear in numerous posts that I wasn’t a fan of the V10’s fingerprint reader, but LG seems to have corrected those worries with the G5. This fingerprint reader provides an instant read and unlock, fits nicely into the all-metal body of the phone, and is positioned perfectly for quick wakes without much work. As many of you know, I’m a big fan of rear-placed fingerprint readers over those embedded in home buttons. Good job, LG. Look, I get it, you all think the dual-camera setup on the back of the G5 that has created a somewhat-oddly-shaped hump on the phone’s backside, is ugly. I’m not not here to argue against that, but what I will say is that these two cameras are going to come in handy at some point in your life. 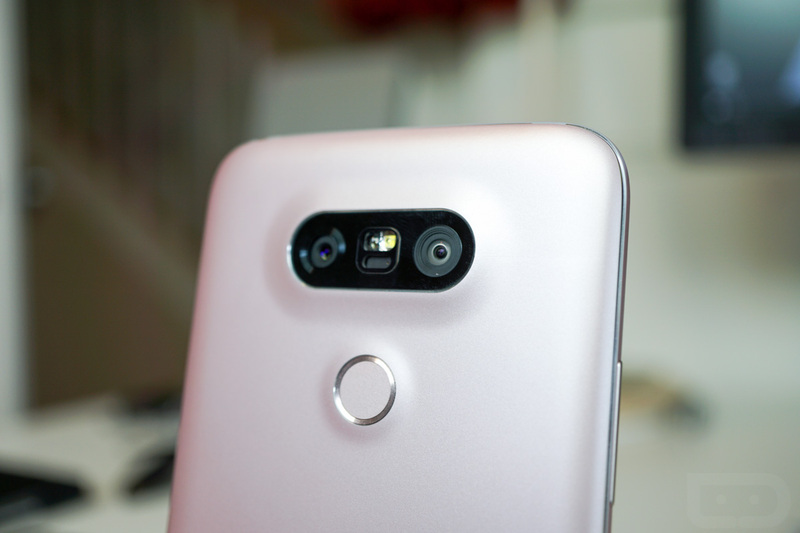 Either that, or the guy next to you with the G5 is going to be able to capture a shot that you can’t and you’ll feel silly for trashing on his humps, his humps, his lovely LG lumps. On the back of the G5, you have a traditional 16MP sensor next to a 135-degree wide angle 8MP shooter. That 135-degree lens allows you to capture entire scenes that you would normally need a special camera lens for, which you will almost never find in a phone. Take a look at any one of our Galaxy S7 videos and you are bound to find enough fingerprints to want to reach for a towel and wipe your screen. With the G5, that’s never going to be an issue, since the phone is all-metal and practically fingerprint resistant on every surface outside of its display. I know, I know, this isn’t exactly the typical “feature,” but it’s worth noting for the OCD crowd in the building.